What to do when The Fire Goes Out! Charcoal BBQ Fire That is. Too often we talk about making some fancy Dino rib monstrosity or some glaze laden pork ribs but we never seem to spend much time on the actual cooking part of the process. Yes, we talk about using smoked woods or charcoal or even gas but we never seem to spend much time on the what ifs of Barbecue. So, in this post we are going to talk explicitly about one of the major what ifs....namely, What to do if The Fire goes out...(BBQ Fire That is...) We make no comments or focus on your personal or professional relationship with someone. This post is strictly focused on Barbecue and Barbecuing. A couple of days ago I was merrily grilling ribs and chicken using the snake method along with some red oak smoking wood. I noticed the temperature creeping out of the friend zone which was target at around 225 to 240 degrees. In fact my temperature when "on wood" was around 310 degrees. So I began notching the grill openings down a 1/4 turn with a check back every 5 to 10 minutes. After the first 10 minutes I actually noticed the temperature rise even more to 320 degrees. Clearly there was either a lot of wood to burn with the charcoal or there was an uneven mix of briquettes in one area. So, after another 10 minutes I added another 1/4 turn on the top vents to reduce the amount of available oxygen in the grill. I noticed around 10 minutes later that the temperature started to reduce. There was a drop of about 5 degrees followed by another drop of 10 degrees so the grill was sitting around 305 degrees at this point way too high for the ribs and chicken. I decided to double down and added a full 1/2 turn closing off even more oxygen to the grill. Within 10 minutes I started to notice a drop in temperature. First the grill dipped to 290 degrees then to 260 degrees in about 10 more minutes. I decided one last notch at about 1/8 of a turn. I checked back 10 minutes later and now the grill was below the 225 degree mark. I thought I would give it some time to level off but unfortunately the grill dropped down to 200 degrees and no longer on wood. I adjusted the vent up by 1/4 but it was too late. The grill had not started it free fall as the charcoals were barely holding on to any heat at all. My last check noted that the temperature was not 178 degrees miles away from the temperature I needed to properly cook my ribs. So, what to do....what to do? After evaluating the situation I realize through the process of elimination I had two or three options. First I needed to check on the time of day. Since I was moving into the late afternoon I only had about two to to three more hours that I could use to get the heat back to level by using a chimney starter. A second option would be to get the fire started, bring the meat to 160 degrees then finish the meat off in the oven. A third option was to again bring the meat to 160 then microwave the meat for about 1 or 2 minutes. The third option was not desirable but in a pinch it does work. Especially if you put the meat back on the grill and allow it to finish with additional smoke flavor. The downside of the third option is that the meat is not as juicy when the microwave is used. Looking at these three options I decided that I could use the chimney starter. I had to get enough charcoal into the unit plus adjust some of the charcoal in the grill that still managed to have some heat. The chimney starter would take a minimum 20 minutes to bring the coals to temperature. After because I was using the snake method they charcoals would need to restart the burning process for the remaining coals. I laid down a single layer of coals about six coals that I could use to stack the coals from the chimney starter. This lay down process would be the igniter for the remaining coals in the snake. I started the coals in the chimney starter then adjusted as needed the coals in the grill. I kept the lid on the grill with the vent wide open as much as possible. After about 20 minutes I noted that about 70% of the coals were close to temperature. Again I checked the time of day along with how much time I would need to bring the meats to the desired temperature. I calculated that I would not have enough time to finish adequately so I would have to employ a second measure to finish by my target of 6 pm. Even though my original target was 5:30 we are into the Summer part of the year so there is much more light available and eating a little later is not a real struggle. The additional heat method I chose was the microwave. I know it doesn't seem like the best thing to do but my focus was on driving up the internal temperature of the meat. The grill was going to handle the smokiness and crispiness of the skin on the chicken. I brought just the chicken in and placed that on a dish and ran the microwave for about 1 minute. I checked the chicken with the temperature probe and noted that the microwave had driven the internal temperature up to 170 degrees. I like my chicken a little more well done so I was shooting for a finished temperature of 180 degrees in the thigh areas of the chicken. I allowed the chicken to rest in the microwave while I checked the coals in the chimney starter. 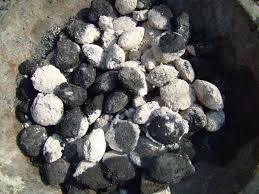 Afterward I poured out the fired briquettes onto the lay down coals and positioned them for maximum efficiency and so that they would quickly start the unlit charcoal. I put the grate back on and allow the charcoal to reach a grilling temperature. I checked my gauge and notice the coals were now back to 240 degrees. Keep in mind through this entire process I had not removed my ribs. In fact the ribs were just about due to be placed into foil for the 2 hour steaming and moisture process. I knew I would not have enough time to complete that process so I chose to notch that down to 1-1/2 hours. I wrapped my ribs and put them back on the grill. The grill temperature was now a steady 240 degrees so both the ribs and the chicken were placed back on the grill. In addition to the meats I added some very small segments of red oak wood just enough to get some smoke going for the chicken. After about 40 minutes my desired temperature of 180 degrees was reached for the chicken. I pulled that off and immediately rested the chicken in the oven. The ribs had a ways to go so I just left those on. After about an hours I probed the ribs and noted they were now at about 195 degrees. My target temperature was 200 so I put the lid back on and continued cooking. After about 20 minutes I received an alert that my target temperature had been reached. I pulled off the ribs and immediately placed them in the oven as well for resting. I knew that if I rested the ribs the total 1 hour I would pass my target eating time of 6 pm so after 30 minutes I removed the foil. Things I noticed following the use of the microwave. The chicken although perfectly achieving the temperature was not as juicy as if it had completely finished on the grill. The ribs was just a little bit tougher that originally planned. I think if I had placed the ribs in the foil meat side down I could have alleviated any toughness. Although the meat would be more wet that some might like but still tasty. Overall, if you are managing your charcoal grill and start to notice a fluctuation in temperature be mindful not to over adjust your vents. Move the vents in increments of about 1/4 inch each and wait at least 10 minutes before making additional adjustments. Prior to the grilling process make sure that the amount of charcoal layered around the grill is evenly spread. Also, keep an eye on the amount of smoking wood used. Sometimes wood can create a sort of false positive in the cooking process. When "on wood" the temperature will rise causing you potential to over adjust the vents downward. Resist the urge to overcompensate and focus on small increments to manage the temperatures. Last but not least bring the meats to room temperature before grilling. This will actually give you a running start when it comes to cooking. If the meat is cold it will take longer to exchange cold for heat and that time wasted may be the time you needed before you temperatures started to go haywire. Always use quality materials on the meats during and after the preparation process. Right now Jake's Famous has some great deals on BBQ Sauce, Dry Rubs, and Table Condiments. Checkout our site today and use code: 1707200910 for an immediate 10% discount at checkout.